As the executive director of the School of Adult and Online Education at Maryville University, Katherine Louthan leads many of the day-to-day operations and helps drive the strategic direction of the School. With a focus on admission and advising, online operations, program support and adjunct faculty engagement, the School of Adult and Online Education team strives to enhance the overall student and adjunct experience and the delivery of rigorous online degree programs that meet the needs of today’s students. She is committed to opening new pathways for adults and nontraditional students who want to complete their education and earn a degree. With a career at Maryville that spans more than 15 years, Louthan earned her MA in Education from the university with her first ten years in the Enrollment Division. She served in various roles including recruiting undergraduates, planning recruitment and scholarship events, and leading enrollment operations. 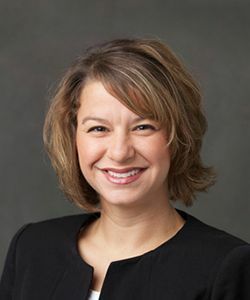 She was part of the team that launched the University’s online nursing program and moved into an School of Adult and Online leadership position in 2012. Strong connections to Maryville, extensive enrollment management experience, and a commitment to meeting students’ needs — no matter their life stage or location — position Louthan to continue advancing one of the nation’s fastest growing online learning programs.